CHICAGO (May 7, 2018) - Hyatt Hotels Corporation (NYSE: H) announced today the grand reopening of Hôtel Martinez, Cannes as part of The Unbound Collection by Hyatt, following major renovations and a complete redesign. Located on Boulevard de la Croisette, the 409-room hotel is one of the most recognizable hotels on the French Riviera, rich in culture and history. As part of a collection of unique and independent properties, this iconic landmark from the 1930s has played host to some of the world’s most distinguished guests, offering the perfect location to enjoy Cannes, including the Palais des Festivals. Every aspect of the hotel-wide redesign pays tribute to its illustrious past while setting it up for the future. Parisian architect Pierre-Yves Rochon has combined the hotel’s original Art Deco style, with contemporary, chic design that takes inspiration from the colors of the French Riviera and the Mediterranean way of life. New features include Version Originale, a restaurant serving authentic regional dishes with a creative twist, Le Martinez Bar offering a festive and glamorous atmosphere and Le Jardin du Martinez, an alfresco dining terrace with a Mediterranean garden setting. These join La Palme d’Or, the two Michelin-starred restaurant by Chef Christian Sinicropi. Hôtel Martinez is the second property in France in The Unbound Collection by Hyatt, joining Hôtel du Louvre in Paris, which is currently closed for renovation. Together they represent a significant milestone for the brand in France and Europe. The hotel has 409 newly renovated Art Deco rooms and suites overlooking the city of Cannes and the Mediterranean Sea. The contemporary interior design by Pierre-Yves Rochon reflects the 1930s with each room featuring white lacquer furnishings and subtle touches of sky blue or light yellow creating a warm and relaxed atmosphere. 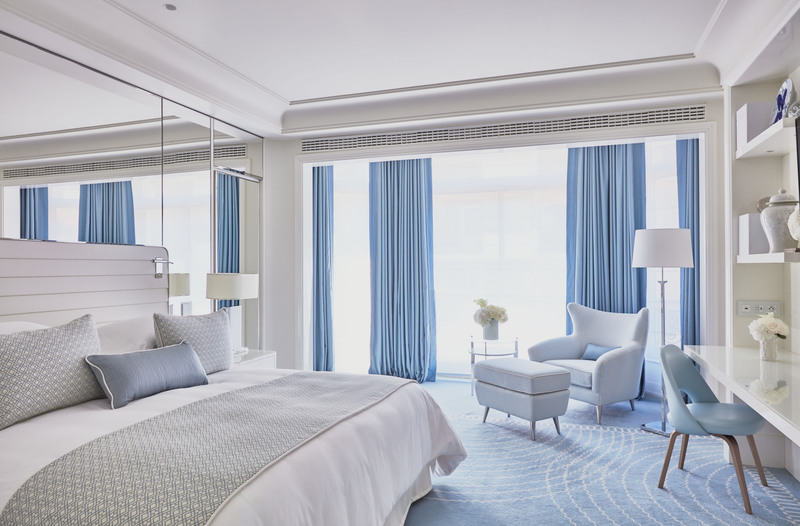 The exclusive Suite des Oliviers and the Penthouse Suite offer one of Europe’s largest private terraces overlooking the sea and the Promenade de la Croisette. The main restaurant, Version Originale, promises a unique experience, through new culinary concepts and traditions from all over the world that push culinary boundaries. Meanwhile, Le Jardin du Martinez offers the perfect outdoor setting for guests to relax in the sun. The garden terrace restaurant delivers a taste of fresh, organic and creative cuisine inspired by the French Riviera. Guests can enjoy a relaxed picnic atmosphere within an oasis of palm and lemon trees. La Palme d’Or, the two Michelin-starred restaurant by Chef Christian Sinicropi is known for creative Mediterranean cuisine taking inspiration from art, literature and philosophy and transforming the best local and seasonal produce into true works of art. From the handmade ceramic plates (created and designed by Chef and his wife) to the excellent dishes, every creation tells its own story and highlights the chef’s passion for nature and art. The sensory experience is enhanced by the restaurant’s elegant design and the panoramic view over the bay of Cannes and the glistening Mediterranean Sea. The Martinez Bar offers creative cocktails and vintage drink offerings served alongside gourmet pintxos prepared on a teppan plancha. With a glamorous setting, clinking glasses and live music, the Great Gatsby spirit of the roaring twenties is ever-present as the sun goes down on the Croisette. The Zplage private beach is the perfect sunny spot to relax and enjoy a colorful cocktail or smoothie. The menu offers fresh, local produce and ingredients carefully selected by our chef and prepared in an authentic Mediterranean fashion. The L.RAPHAEL Beauty Spa in Cannes is a haven for peace and tranquility. It offers a wide range of relaxing and luxurious treatments including its signature Oxy treatment, a non-invasive skin therapy using a stream of oxygen that delivers active ingredients. For guests who want to stay active, they can enjoy a total body workout at the fitness center and sauna which are open daily, or for those who prefer running outdoors, Cannes and its surrounding area boast a variety of running routes with beautiful landscapes and views. The concierge team is happy to provide running maps and share their recommendations to recharge your spirit. The Kids Club, open in July and August as well as during the winter holiday period, will offer a range of exciting activities for young guests (between 4 and 11 years old). The program includes individual and team games, as well as educational activities supervised by a professional staff. Hôtel Martinez offers 26,910 square feet of meeting space and 15 flexible meeting rooms. Certified with the Green Globe Gold status, Hôtel Martinez was the first hotel member of Green Globe in the French Riviera who committed to protect the environment and use sustainable business practices throughout the entire event planning process. For more information, please visit hotel-martinez.hyatt.com. The Unbound Collection by Hyatt brand is a portfolio of new and existing upper-upscale and independent hotel properties, ranging from historic urban gems to contemporary trend-setters, boutique properties to resorts, and private home accommodations. Whether it is a fascinating past, an exclusive location, famous architecture and design, or an award-winning dining experience, the properties in the collection provide independent-minded travelers with story-worthy experiences and allow them the freedom to be unique. Current hotel properties include The Royal Palms Resort & Spa in Phoenix; The Confidante Miami Beach in Miami Beach, Fla.; The Eliza Jane in New Orleans; The Bellevue Hotel in Philadelphia; Holston House Nashville in Nashville, Tenn.; The Driskill in Austin, Tex. ; Spirit Ridge in Osoyoos, British Columbia; Hôtel Martinez in Cannes, France; Hôtel du Louvre in Paris (under renovation); and Carmelo Resort & Spa in Uruguay. For more information, please visit unboundcollection.hyatt.com. Follow @UnboundxHyatt on Facebook and Instagram.